A video showing the woman being made to take off her black burqa minutes before the chief minister makes an appearance at the rally yesterday has gone viral. 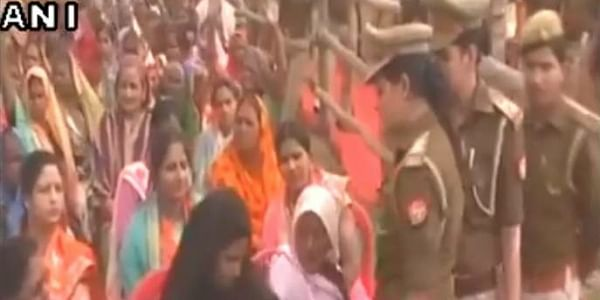 BALLIA: The district administration here has ordered a magisterial probe into the incident of a woman being forced to take off her burqa in public at Uttar Pradesh Chief Minister Yogi Adityanath's rally, officials said today. "The city magistrate has been asked to conduct an inquiry into it and action will be taken against those found guilty," District Magistrate Surendra Vikram said. The chief minister was here yesterday to address an election meeting ahead of the local body elections. The woman, who identified herself as Saira, later said the women constables on duty asked her to remove the black burqa, the outer robe worn by women in some Islamic traditions, which she did. She said she was a BJP worker and had come to the rally from her village wearing her "traditional dress". The police has also ordered an inquiry. Superintendent of Police Anil Kumar said the video footage has been received and a departmental inquiry ordered in this connection. "The Deputy SP (City) has been asked to conduct an inquiry in this connection," the SP said. "We had instructions that there should be no black flags shown at the rally. I will get this looked into," he said. Three days ago, black flags were shown to the chief minister in Meerut, where he had gone to address an election rally. In the scuffle that followed, BJP supporters thrashed a man.